So, we’ve finally got our hands on some Thermoworks products other than the trusty Thermapen. Thermoworks have quickly became one of the leading manufacturers of digital timers and commercial thermometers and have made a name for themselves for creating some of the best thermometers available today. Their products are generally very high quality, incredibly durable and super user friendly, but come at a high price. A lot of the products are made for professional kitchens and restaurants, but if you’re looking for some of the best thermometers for your home cooking or outdoor kitchen then a Thermoworks thermometer might be just what you’re looking for. Today, we’ll take a look at the Thermoworks ChefAlarm and see if it has what it takes to get a recommendation from both of us at KotC. The ChefAlarm was designed with professional kitchen use in mind so is therefore a single probe thermometer. 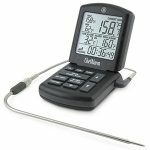 You might be thinking that this instantly makes it inferior to the dual probe thermometers that are designed specifically for barbecuing and outdoor cooking. But not so fast. Despite losing the ability to read the temperature of your pit at the same time, there are many great features that make the ChefAlarm ideal for all kinds of cooking, not just for grilling or smoking. Firstly, the Thermoworks Probes are some of the best we’ve tried, they’re incredibly accurate, even at high temperatures, and are some of the most durable you can buy. It isn’t just the probes that are of a high quality, the main body is well designed and sturdy. It feels good in your hands and you can instantly tell the high quality. The body can fold up nicely to sit on a shelf, or you can use the built in magnet to stick it to your smoker or kitchen appliance. Also, the body is partly water resistant and comes in 9 colors, which is nice! The ChefAlarm also features alarms for both hot and cold temperatures. Standard BBQ thermometers will give you high temperature alarms, but this isn’t a standard BBQ thermometer. 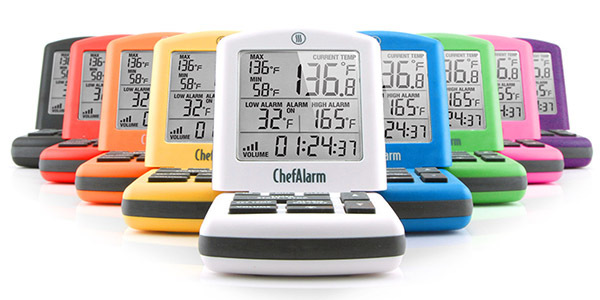 The low temperature alarm is a nice addition that adds huge versatility to the ChefAlarm. With a low temperature alarm, you can easily monitor desserts, yogurts and other cold foods. The alarm itself is also more than you’d expect from a general digital thermometer. You have more control over the volume, with a maximum volume of 92dB, to give you more control over how you are alerted. This is likely to be of more use in a commercial kitchen, but it’s nice to have a quality alarm if you’re cooking outdoors. The Thermoworks ChefAlarm also features continuous min/max temperatures to show you the highest and lowest temperatures your food reached during its cook. If you’re grilling or smoking in the cold and you have to turn the meat, then having the max temperature on display will easily allow you to get the meat back up to it. The ChefAlarm also includes a very nice little zip wallet that protects your ChefAlarm and your probes when you’re not using them. It also makes transporting and storing it much simpler. One of the things that we like about the design of the ChefAlarm is that Thermoworks have kept it simple. There are single buttons for specific actions that are big and easy to see and press when the pressure is on. The last thing you want if you’re under pressure is to have to fiddle around with small buttons and confusing controls. With the ChefAlarm the controls are simple and the buttons are big and logical, which works great for commercial kitchens, but also at home. Not only this, but they are very well made, durable and they feel like they’re high quality. This can be said about most of the ChefAlarm thermometer. The general design and build quality are very good and the additional little features, like the magnet, really add to the overall design. The only downside is that the screen is only splash proof. At this price it would have been nice to have a little more water resistance built in. So, if you’re thinking of doing some low and slow smoking on a rainy day, you’ll need a plastic bag or cover to keep it from breaking. Where the ChefAlarm really excels is its ease of use. Like we mentioned before, the button layout and design are fantastic and make using it incredibly simple. But it also has a very clear screen that has all the information you need on one page. This might seem a little cluttered to start with, but after a use or two it become very useful. 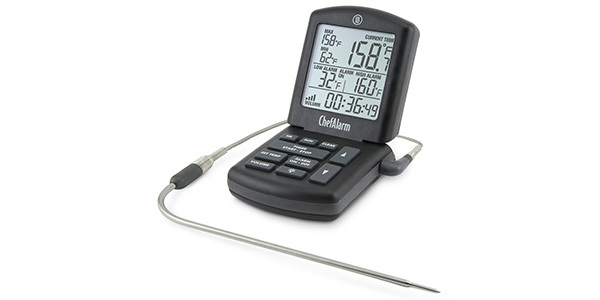 We think that the Thermoworks ChefAlarm is the easiest to use digital thermometer we’ve tested. Other small features, like being able to calibrate the thermometer simply and the quick set up make the ChefAlarm so easy to use. The battery life is also very good. With just two AAA batteries you will likely get a year or so of use out of it without having to change the batteries. Just remember to have a couple more in storage for when they inevitably run out. 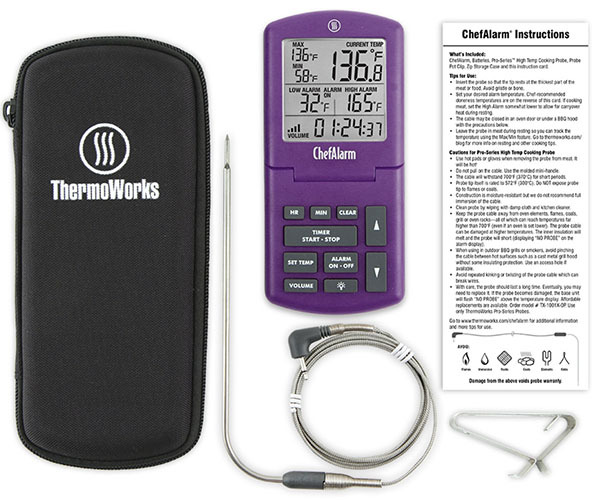 The Thermoworks ChefAlarm is probably the best single probe digital thermometer on the market. It’s very well designed, well built and has a lot of little features that make it stand out from the competition. In comparison to the ThermoPro TP07 you’ll be getting a much better thermometer with many more features, but you’ll be paying more for it. That’s the only major downside to the ChefAlarm, like most Thermoworks products. You’ll be looking to pay as much for the ChefAlarm as you would the ThermoPro TP20, which is a wireless dual probe thermometer that we highly recommend. You do get a brilliant thermometer but for many people the price may be too much. But if you’re looking for a hugely versatile and very high quality thermometer then the ChefAlarm is exactly that. Check the latest price of the ChefAlarm on the Thermoworks website. We would recommend buying a ChefAlarm if you’re an enthusiastic home chef who cooks a wide variety of different foods. There is enough versatility in the design for the ChefAlarm to be used in the home oven, a smoker, a sous vide cooker or even a turkey fryer. If you run a commercial kitchen, the ChefAlarm is absolutely perfect and we recommend buying multiple. The design features that make it so good for professional use also transfer perfectly to home use, so if you’re just looking for a great thermometer then this is ideal. If you are looking solely for a smoker thermometer then we’d recommend either the Maverick ET-733 or the ThermoPro TP20 (our reviews are in the links). This is because these two thermometers are made specifically for low and slow smoking. They both have dual probes which give you a lot more information that makes them ideal for when cooking on coals or wood. Always try to keep the meat temperature under the temperature rating. This is one of the biggest killers of digital thermometers. It’s easy to accidentally touch a grill grate or the inside of the oven which could be hundreds of degrees above the recommended max temperature. Going above the maximum is likely to damage the cable that the probe is attached to which can instantly kill the probe. The ChefAlarm has a great probe, so this is a smaller concern than some other thermometers. We hope our ChefAlarm Review has helped you decide whether this is the thermometer for you. If you need more help then feel free to comment or connect with us through our Facebook.